A new season is once again upon us. God tells us in Genesis 8:22 “That as long as the earth remains, there will be spring time and harvest, cold and heat, winter and summer, day and night.” We will experience the beauty God puts before us in the gold, red, and orange leaves of autumn. The air will become crisp and cool as we pull out the jackets and put up the summer flip flops. Our kitchens will also be filled with the smells of pumpkin and spices. Families will gather together as we celebrate all that God has provided for us. Oh, I love this season! 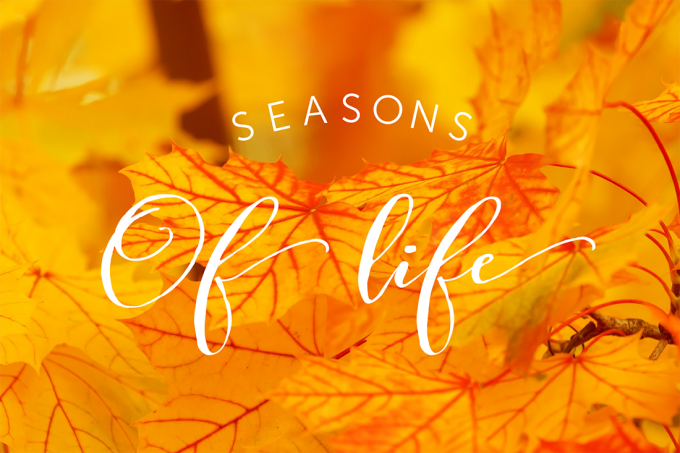 God also presents us with seasons of life. Ecclesiastes 3:1 says “There is a time for everything, and a season for every activity under heaven.” Some of these life seasons are easy and others are more difficult. I have experienced, like many of you, seasons of joy, tears, laughter, love, healing, sickness, grief, and uprooting. The most recent change of season for me was when I decided to retire from my teaching career. I loved every minute of what I have often referred to as my ministry as a public school teacher. It was so very difficult to let it go. I didn’t want to feel uprooted from 30 years of what felt so good. You see, I wanted to be in control but it seemed like every sermon and every song I heard was about stepping out in faith. When I allowed God to speak to me about having faith in what He could do with my decision, it became so very easy. I began to search God’s word for answers. In Proverbs 3:5, God tells us to “Trust in the Lord with all your heart and lean not on your own understanding.” I knew then that I must let go and let God have control. As I let my faith grow in what God could do, this season was no longer such a challenge. He began to give me the peace and joy I so longed for. My husband and I are also walking a season of healing as he battles health conditions. I know this is a season for God to stretch us and pull us close to Him. I have learned to be thankful in all circumstances. God tested the Israelites in the wilderness for 40 years. This makes my seasons, however difficult they may be, seem very short-lived. I know God has this season under control. One of my favorite verses is Romans 8:28 “We know that in all things God works for the good of those who love Him, who have been called according to his purpose.” Notice God calls us to a season for His purpose, not our purpose. I encourage you to have faith and let God have control of each season. He can make life so easy and you can just enjoy the ride. I still have the church bulletin from July 24. The message that day really spoke to my heart. The theme was “Faith in Action” and the message featured Andrew—one of Jesus’ disciples. Remember? I’m not sure what impressed me so much about Andrew. Maybe it was the fact that he was a “go getter” who immediately shared the good news he had discovered with his brother. Maybe it was the fact that even though busy, he dropped everything to follow Christ. Maybe the connection was that Andrew took note of a child and brought him to Jesus—allowing that kid to be part of something BIG. One thing for sure—Andrew was the kind of guy who made a DIFFERENCE! That difference started with his family and created a ripple effect that would impact the world. I want to be like Andrew! I want an active faith. I want to be part of a movement that IMPACTS. Do you have that passion? If you are passionate about being used of God to transform lives and impact the Wentzville community for Christ, the Good News Club® ministry is for you! 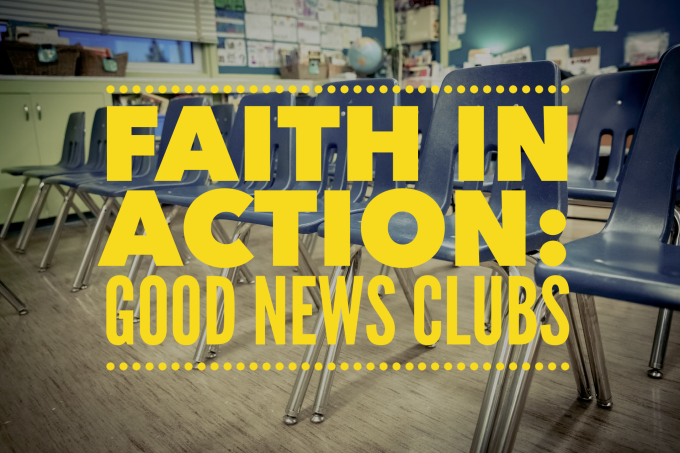 Our church has launched its first after-school Good News Club at Heritage Intermediate School! It meets on Tuesday afternoons in the school’s multi-purpose room. In 2001, the doors were opened to take the Bible into public schools. The U.S. Supreme Court ruled in Good News Club v. Milford Central School that Good News Clubs can meet in public schools after school hours on the same terms as other community groups. Since then, thousands of after-school Good News Clubs were born! Mat Staver, the Founder and Chairman of Liberty Counsel said, “The Good News Club gives the local church the way to carry the Gospel into the public school, then involve the kids and their families in your church.” That’s the goal of this outreach ministry! God can use teens, retirees, homeschool families and others who would be willing to be available on Tuesday afternoons to lead the Good News Club. Child Evangelism Fellowship® has training available that will help prepare you for this action-packed outreach opportunity that includes a Bible lesson, memory verse, songs, games, snacks and more. Unsaved children will hear the Gospel of Jesus Christ and be invited to receive Him as Savior. Saved children will be challenged to grow in their faith. Pray! Pray for the teaching team to be faithful and true. Pray that God will bring the children of His choosing to the Good News Club at Heritage Intermediate. Join the team! There’s a screening process required for each participant who has contact with children. If you are not already background checked by our church, Child Evangelism Fellowship will cover the cost of your background check. When approved, you will receive a nametag that identifies you as a screened volunteer. If you need instructions for the screening process, feel free to e-mail me at . Bring kids to Good News Club! Public school facilities for after-school activities held in the Wentzville school district do not open until 4:00 PM—well after school has dismissed. That means that children who want to attend Good News Club will need to leave school property and then return for the club. You can help by bringing children to the club location. Spread the word! Every child needs parental permission to attend Good News Club. Permission slips are available at the church office. They are also in the offices of Heritage Intermediate and Heritage Elementary. I’d be glad to e-mail you a document you can print and share! Children from any school/homeschool are welcome to attend! Everyone who wants to make a difference can have a part in the Good News Club ministry! Let’s reach our “Jerusalem” with the Gospel of Jesus Christ! Let’s be part of a movement that impacts! Let’s ask God to help us reach the children and families of the fastest growing city in Missouri for Christ. Want to learn more about the Good News Club ministry? Go to www.cefonline.com/goodnewsclub for more information!